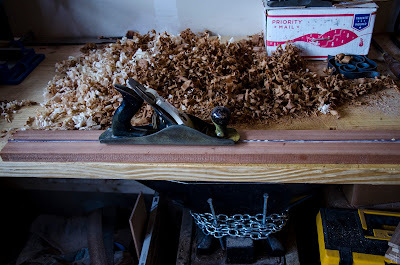 With the start of the new year behind me, I thought that the remainder of this project would come together fairly quickly. 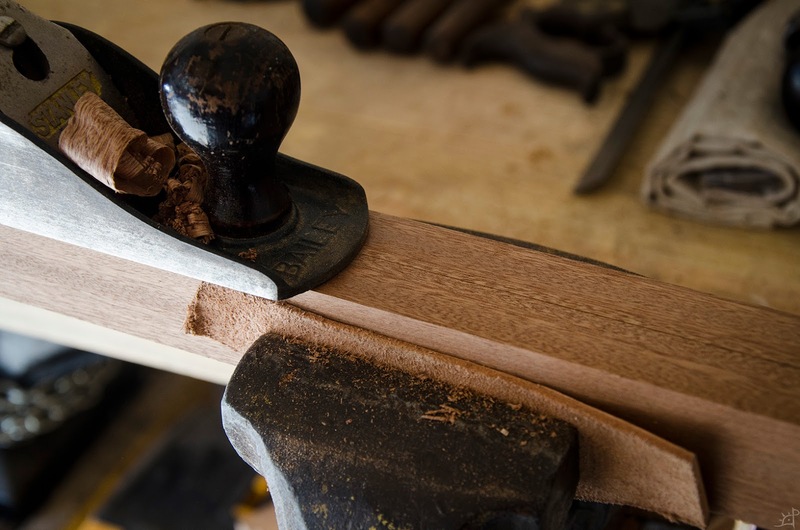 Three or four major questions lay before me after finishing the internal framework, and all save one have to do with the neck. 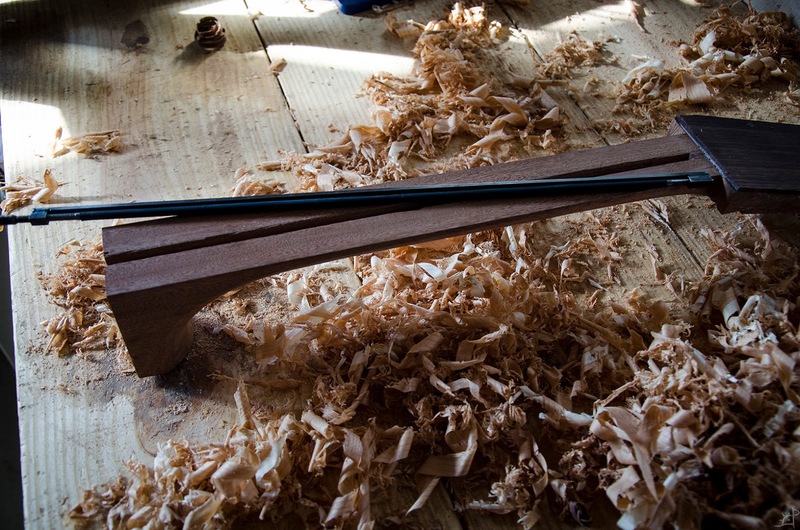 Foremost of these is how to join the neck with the body in a way that is both precise and stable, able to handle the tension of the strings without causing catastrophic damage to the body yet simultaneously looking visually unobtrusive. That problem I saved for a later post, as first I needed to actually make the neck and navigate the various aspects which, to someone who has never played a stringed instrument of the sort, are entirely foreign. 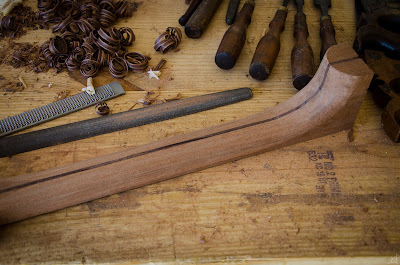 To begin, I first needed to figure out what wood to use for the neck. I had a plank of sapele, which is vaguely related to mahogany (and through advertising schemes is sold as a similar species although really unrelated), but it was a bit too uniform for my intention. 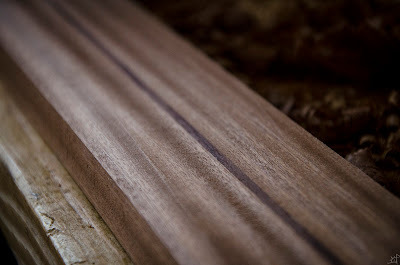 The wood itself is nicely figured and pleasing to the eye, but there is minimal variation and I wanted something more. 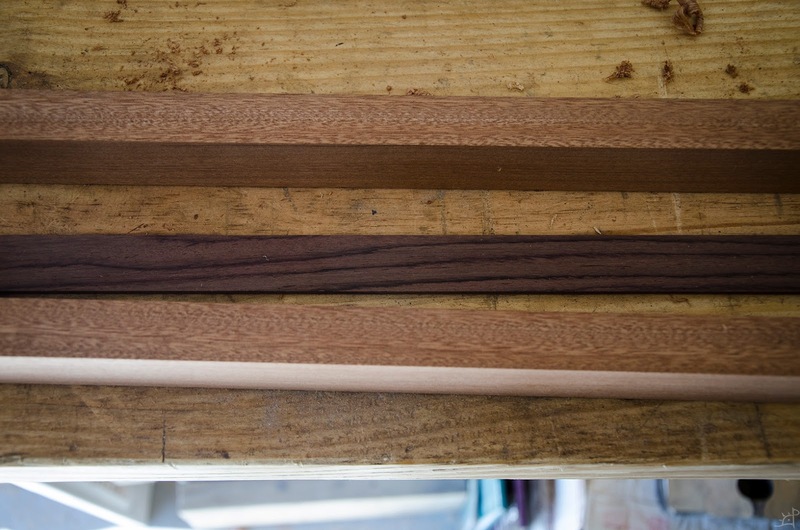 It was then that I remembered I had strips of rosewood left over from the sides, which happened to be nearly the exact same width as the sapele. So, I got to work and found the centre of the sapele board to rip. Concurrently, I have been working on building a dining table, so ripping boards has been the bane of my past few weeks. Each time I need to make a long cut, it has been with an enormous amount of begrudging reluctance. 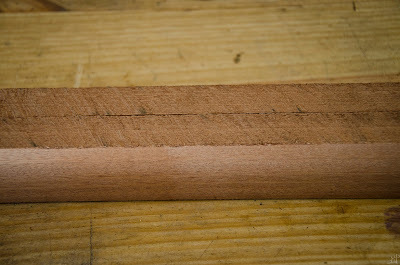 Fortunately sapele is fairly easy to cut, unlike some of the harder species I have been working. 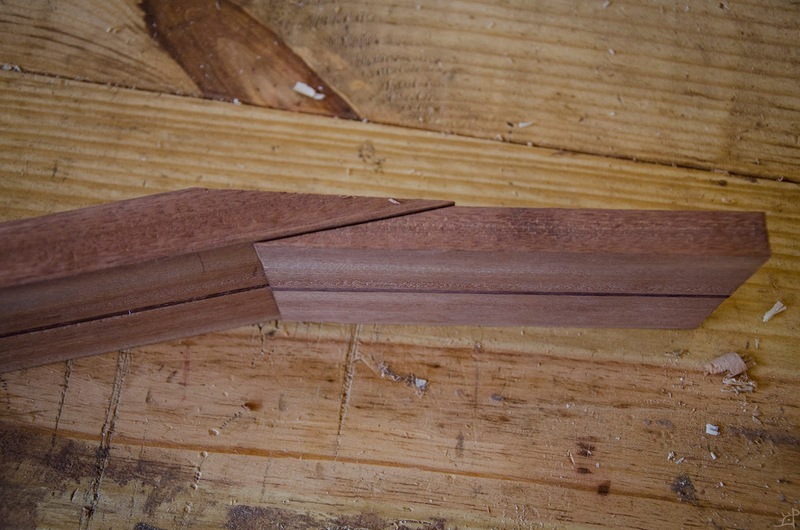 Despite the edges being extremely close in height across the entire length of the two halves, I decided to joint them anyway. 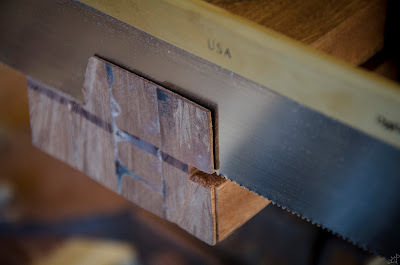 The outside, uncut edges would have been fine for the glue surfaces after a bit of truing with the jointer plane, but I had the fortunate realization that it would be far easier later on to have a square board to work with. 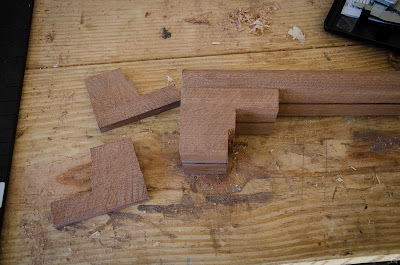 As with the tops and backs, I used the same trick of planing, jointing, then turning one board around and re-jointing. This is the fastest and easiest way I have found to help ensure that the two boards are the same width across their entire length. Late last year I picked up a few new tools, one of which being a straight edge. Although a longer one would have been better suited here, it did the trick just fine. All along the length, I checked for any gaps, of which I found none. 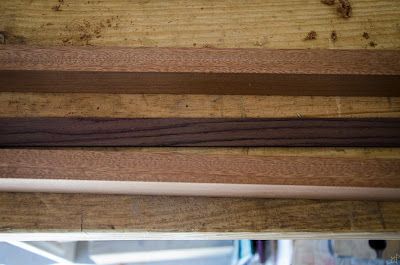 Now that the surfaces are jointed, I introduced the rosewood stripe. 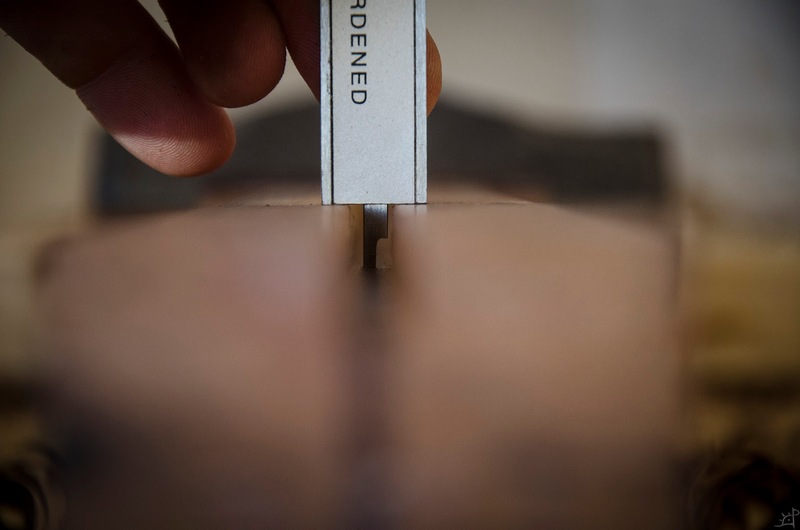 This will follow the centre of the neck, visible only on the back side (because the fretboard will be on top of this assembly). 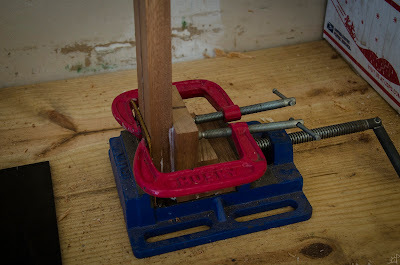 Once again, my severe lack of clamps makes this needlessly difficult. 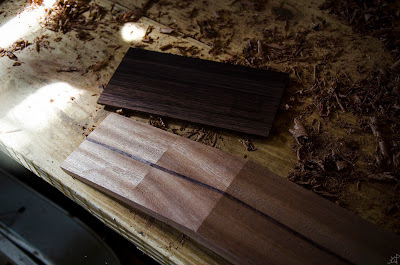 A day later, the board is ready to be surfaced. After scraping the glue away with chisels, it's onto the planes. At this time, I was worried about the wild swings in humidity that came through. 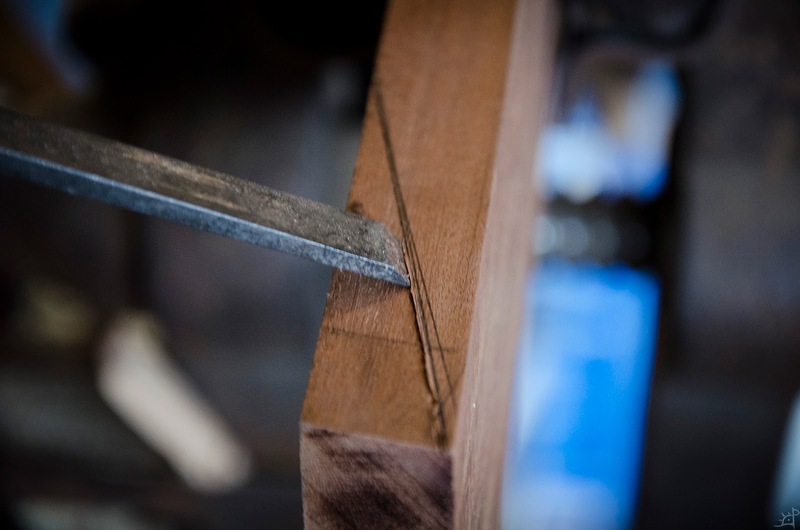 There were a few nasty bits of cupping that happened to a curly maple board as it was being glued, causing large gaps to open along the seam. 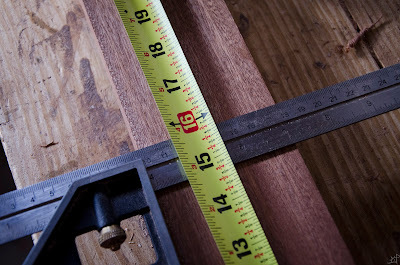 Fortunately, I had no trouble with the sapele, whose dimensions were a bit more stable for the joints. Next up it's figuring out how to angle and attach the headboard. With the advice of some more experienced woodworkers than myself, I eventually came to a reasonable solution that did not involve a precariously small glue surface. 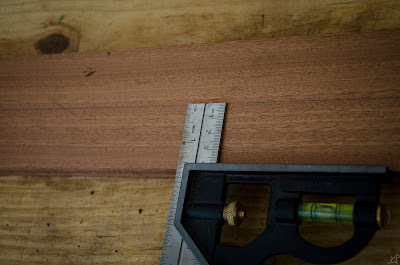 Cut to length and oriented so the grain would be as uninterrupted as possible, I marked a 14 degree angle on the neck (left) that will join with the headboard (right). 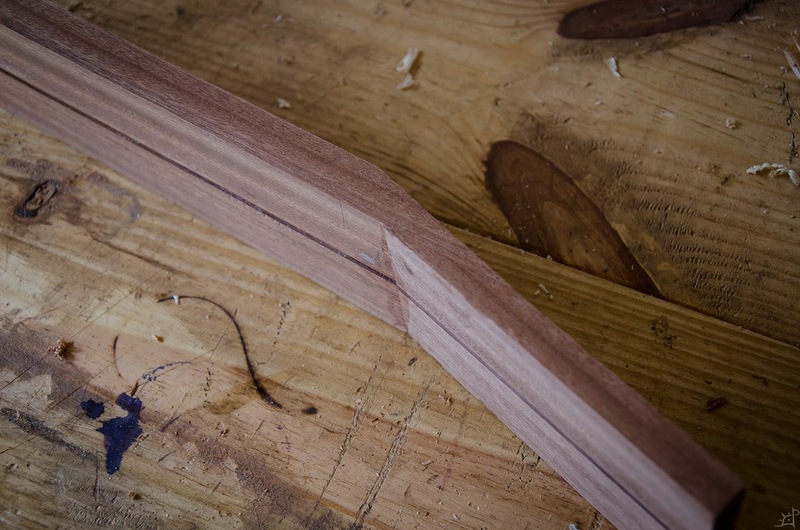 Here, I made absolutely certain not to unseat the angle once I traced it, as it will be used a second time for the headboard. 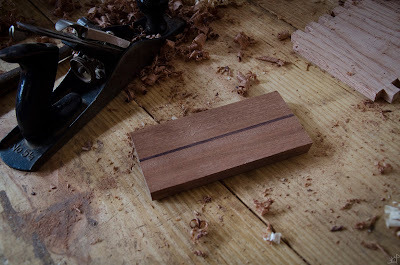 As a brief interlude, this is how I establish lines for cuts that need to be particularly precise. First, once the line is drawn, I take a straight edge and scribe the line fairly deeply with a marking knife. 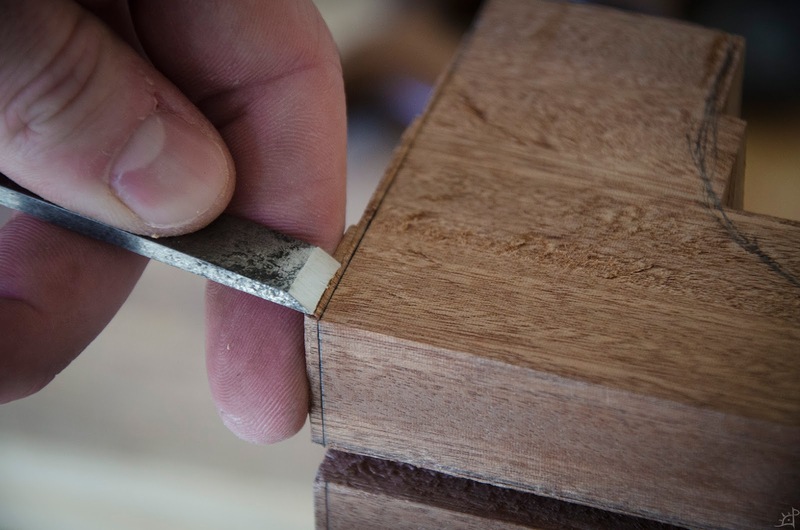 If it is bevelled, have the flat of the edge on the side of the cut you will be keeping. That way, the scribed line has a perpendicular knife wall on the important side of the cut rather than an angled one. 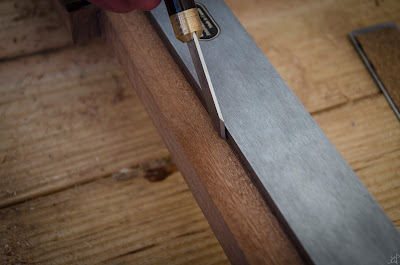 Next (ignoring the other lines drawn on there) take a chisel and carefully pare away wood towards the scribed line. I will be keeping the right side of the line and discarding what is on the left, so I work from the left towards the line. This preserves the perpendicular corner established by the marking knife. 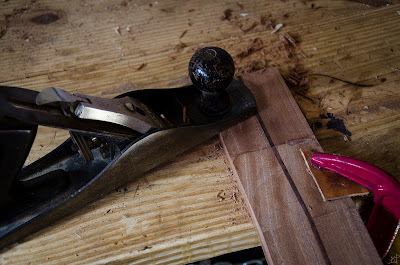 Now, there should be a wedge shaped line cut into the board. 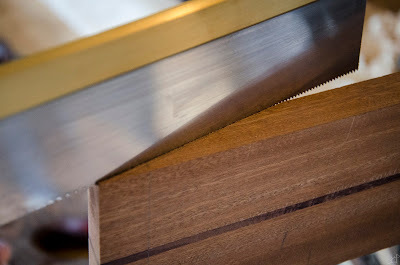 Finally, take the saw and seat it in that newly formed channel, aligning the edge with the perpendicular knife wall. The rest is down to good hand saw technique. 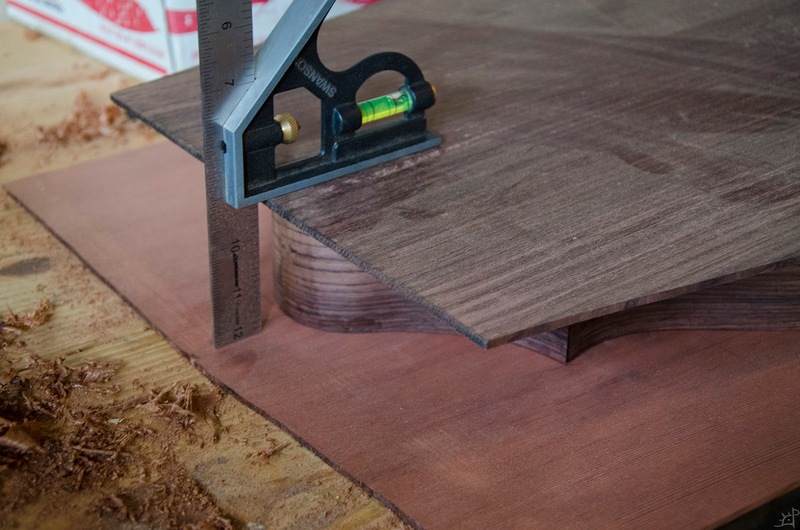 Before starting this project, I would have been terrified to try and make a cut like this, being wide, deep, and demandingly precise. Along the way, I have learned more than I expected, and already have the confidence to move forward. Practise, as they say, makes perfect (not that this is remotely close to perfect, but you get the idea). With the support of another board, I cleaned up the cut with a block plane, removing only enough to take out the last of the saw kerf. Checks out. Parallel, plane, and square. At this point, things are positioned a bit backwards. 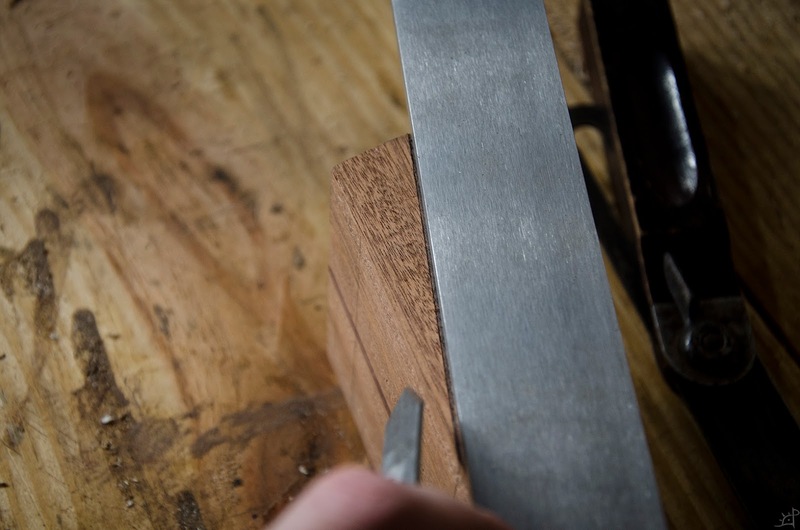 The leftmost piece will actually be underneath the length of the neck, but I needed to position it to verify the angle of the cut as well as the thickness. 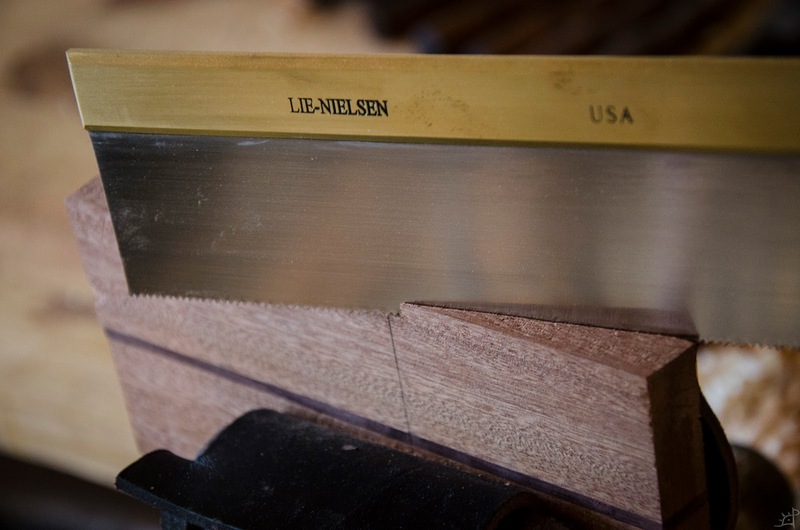 That lien scribed along the length of the block about a third of the way down from the top is where it will be resawn, then the angle following the top side of the longer neck where the angle will be cut. Once more, a cut that would not have gone well a year ago. A wee bit of cleaning with the plane and it's ready for cutting the scarf. 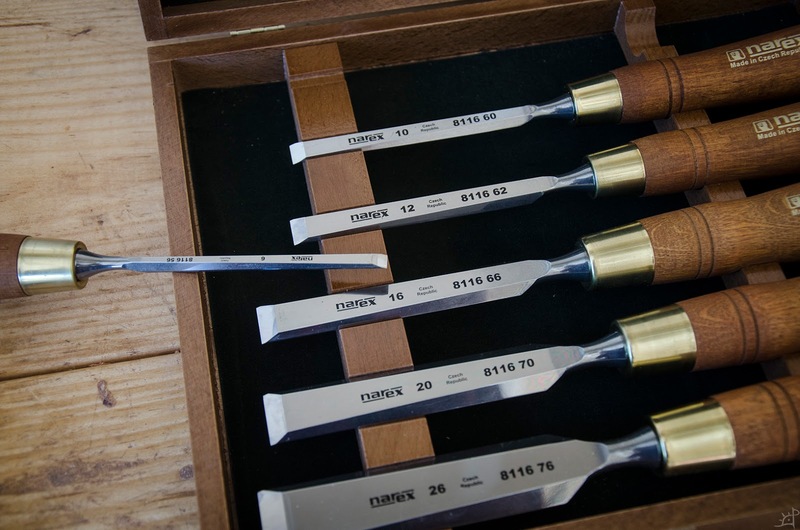 Same operations as before, mark, scribe, chisel, and cut. 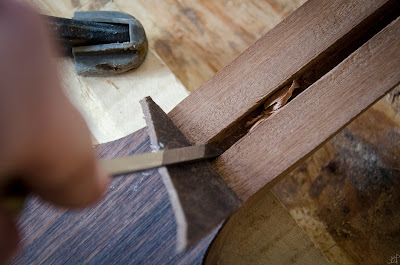 And here is the position of the neck. Originally, I intended on having the scarf be on top of the neck, but the way the dimensions worked out, that was not possible. Instead, I flipped it around and brought it to the bottom. 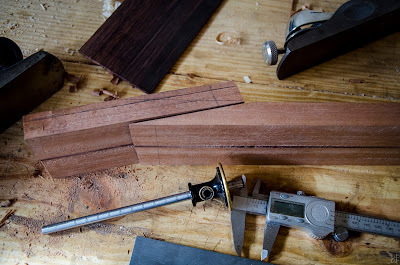 On top of that joint will be attached a faceplate of matching Bolivian Rosewood which has been used in the sides, back, and centreline of the neck. 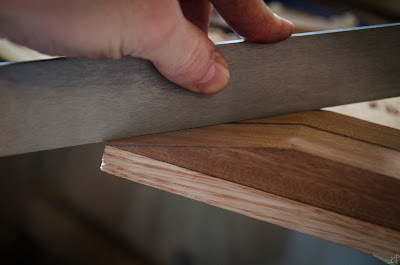 Gluing this joint was a bit tricky. 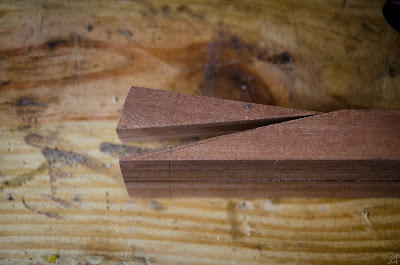 Because it is essentially two wedges, any pressure tries to spread them apart. After a bit of trial and error, I eventually got it seated, but not without about half a degree of rotation towards the bottom corner. Once the head is shaped, it should not be noticeable. Fortunately, the humidity did not destroy this joint either. Post planing operations, it is almost invisible on the edges. 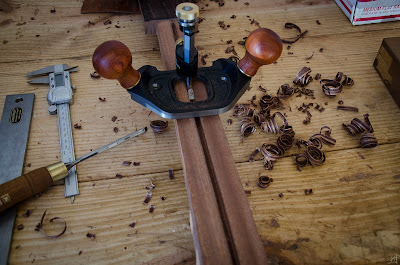 Preparing the face for the rosewood overlay was a bit tricky, as there was no good way to hold the neck to the bench with the 14 degree bend in it. Doing it half at a time, then blending in the middle did well enough. And, despite being wondrously smooth, the seam is harshly visible because of the change in grain direction. Nearly there. The neck side is still about ,1mm lower than the rest. Easy enough to fix, but extremely important. 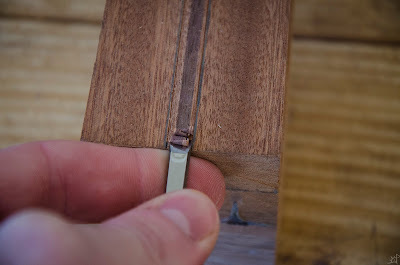 PVA glues, like the one I have been using, is not designed to be a gap filling glue, meaning if there are gaps it will probably not be filled. All nice and flat. 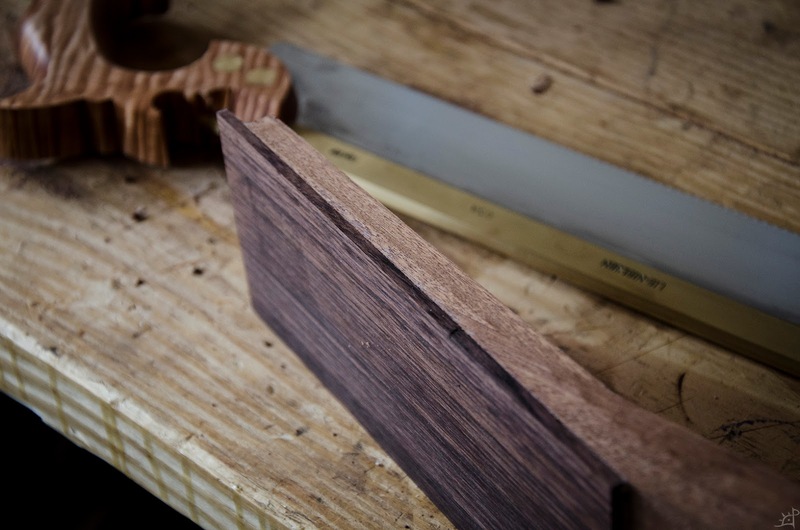 The rosewood faceplate suffered a bit of warping from the humidity swings, and proved difficult to flatten because it is so thin. In the end, as good as I could manage had to be good enough. 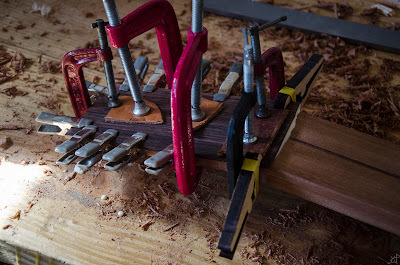 If I could have fit more clamps on there, I would have. 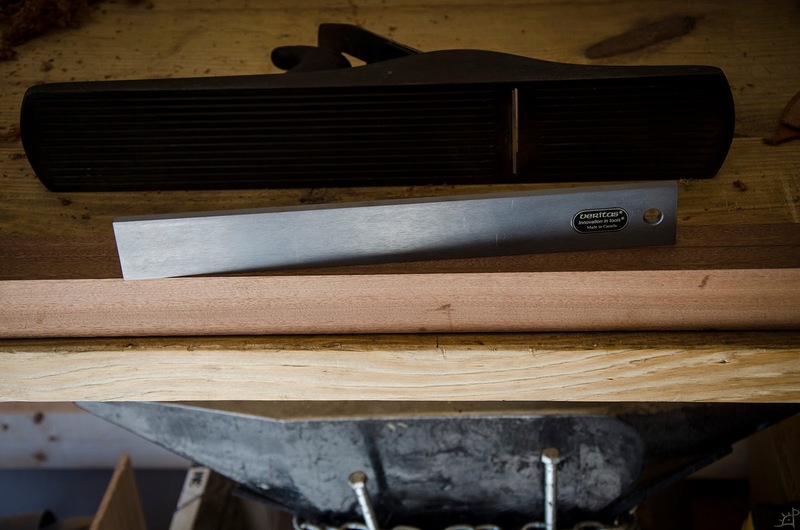 Again, because it is so thin, pressure distribution is not ideal, so the more the merrier. 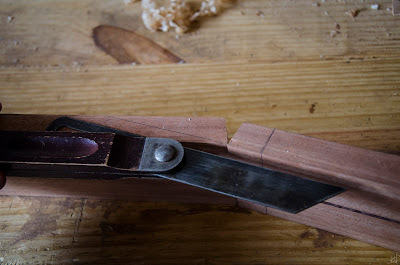 Using the spokeshave, I removed the majority of the excess rosewood, then back to the planes. Based on the dry assembly, I knew the edges would be the worst part, and with the joint clean I am satisfied with how it came out. 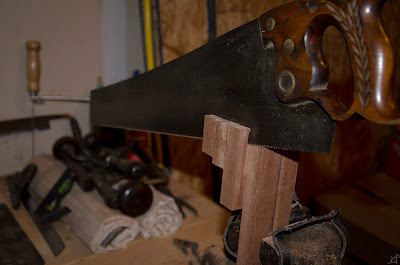 Just a quick trim of the far end of the headboard. 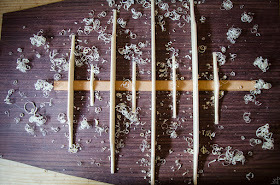 And a rabbet plane to square where the nut (raised bit that aligns the strings) will go. Before moving forward, I decided to check one last time for flatness on the length of the neck. Looks good. Based on my particular fretboard configuration, I cut the neck to length, adding an inch and a half for the joinery to the body. Next up is figuring out the taper for the neck. 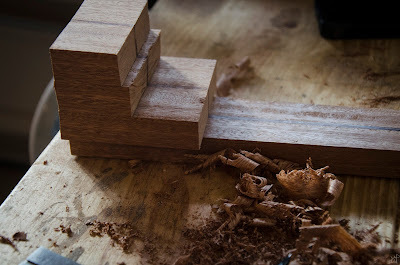 Widest at the joint with the body, I did some math and came up with a 2,25" width at the base, and something narrower that made sense in fractional form at the end of the neck. Thereafter, it was as simple as connecting the dots and making some long cuts. 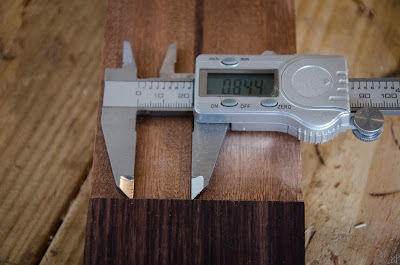 I was a bit worried that the sapele would not be symmetric across the rosewood. At intervals along the cut, I checked with the callipers and it was all within the accuracy of the readout, so I suppose I can be convinced. For this next part, I had a great deal of deliberation. 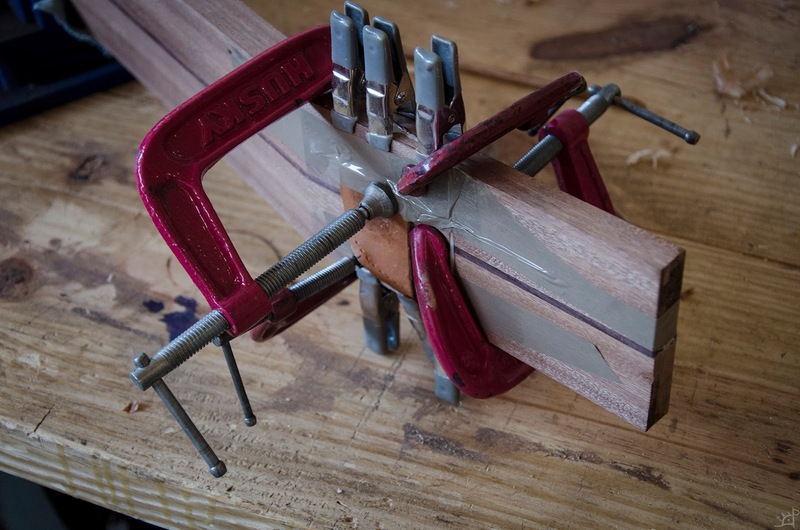 I was not certain there would be enough of the neck cutoff to build up material for the joint, and I did not have anything else I could use as a substitute. 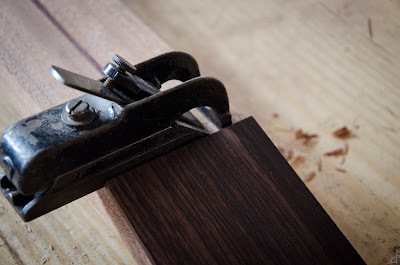 I tried to devise a number of alternatives from veneering the sapele on something else, to having a secondary internal joint, to a handful of other, worse alternatives. In the end, I just went for it and it seems to be alright. 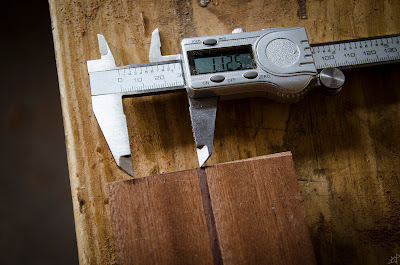 The heel of the neck needs to be as tall as the body, so I measured that and began cutting the last piece of laminated sapele. To accommodate the radius, the bottom piece needed to be far longer than the others, which was worrying to the remaining material at my disposal. At this stage, the only important part of alignment was the strip of rosewood. To appear as one solid piece of wood, the stripe needed to match perfectly on both sides, meaning there was zero room for error when tightening the clamps. 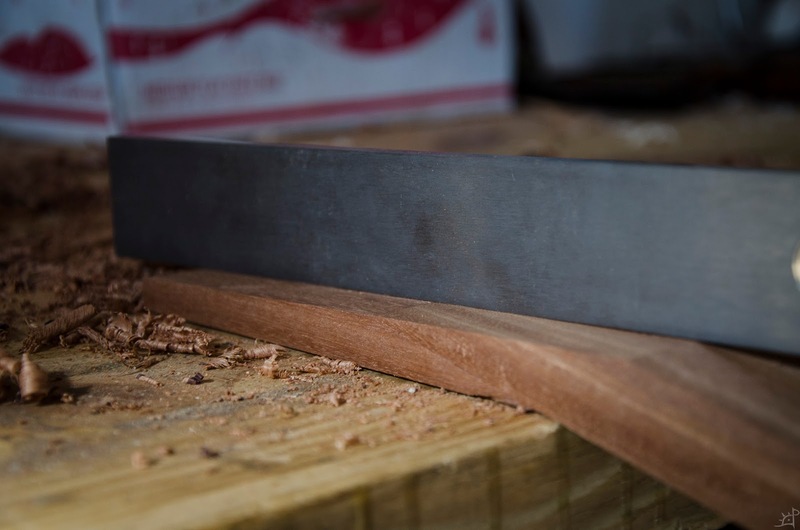 After drying, the excess was trimmed off to match the angle of the neck taper. Lovely. 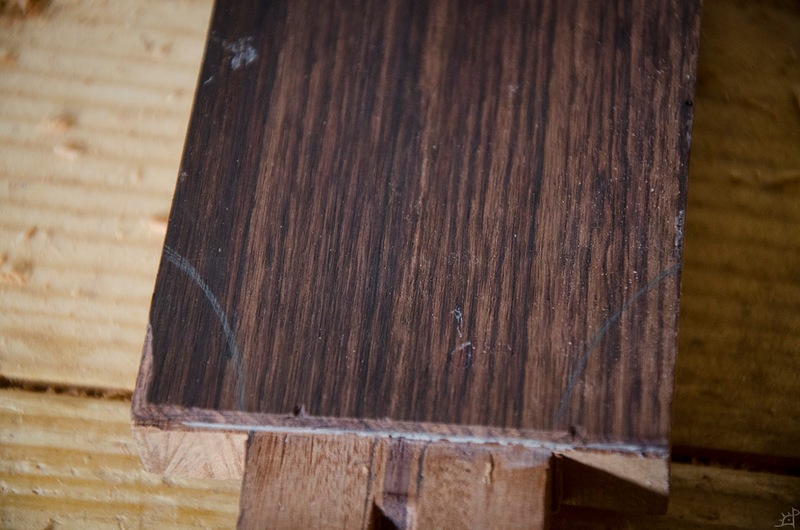 The seams virtually disappeared, save for the changes in grain direction. 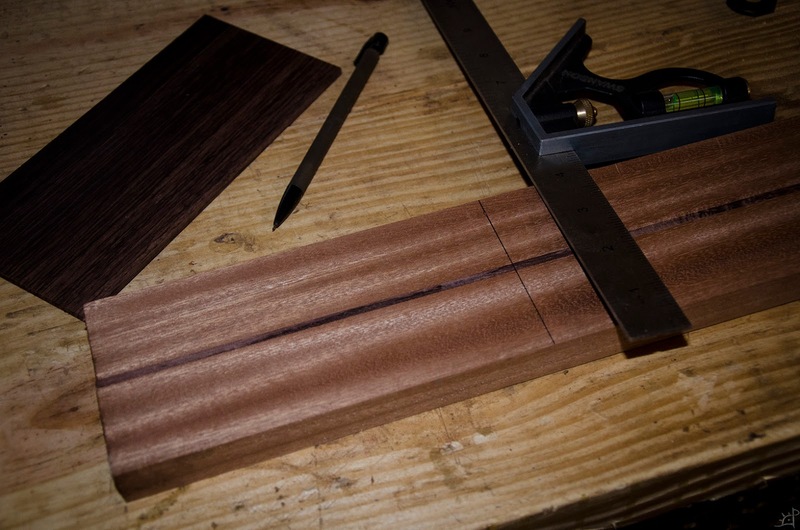 One of the last things for this post is to route the channel for the truss rod. 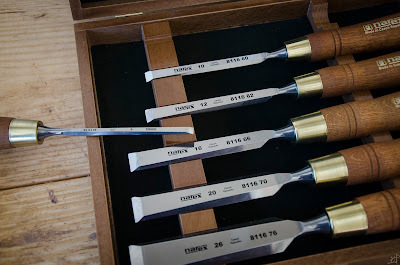 Going into the project, I did not know that these existed, much less what they do and that I need one. Essentially, truss rods apply tension either up or down on the neck to compensate for the tension of the strings. It is a pair of metal rods that deflects at the turn of a screw on one end, causing it to bow up or down. Through the use of chisels and a router plane, I carved the channel according to the instructions of the manufacturer, but without actually having the rod. 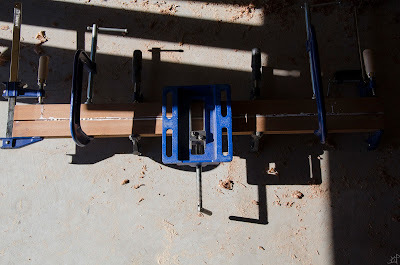 This was one of the major delays, as I could not move forward with the final fit until the truss rod arrived. ,25" wide by ,375" deep, the groove began the same as any other, lines scribed and marked. Routing this channel was absolute anarchy. 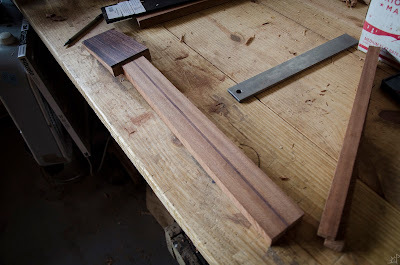 The sapele grain did not make a wit of sense, it going one direction on the flat and another on the perpendicular walls, with the rosewood opposite that. 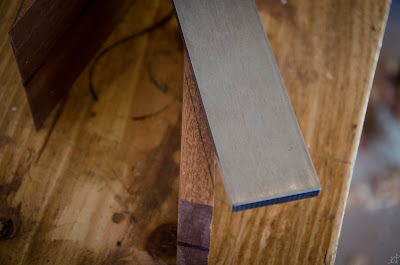 When the groove was deep enough to begin use with the router plane, it went a bit better, and fortunately I had a 1/4" blade for it, which removed one level of uncertainty with the precision of the cut. This being one of my first opportunities to use the router plane, I was impressed with the control and ease of use. I need to sharpen the irons, but otherwise it worked like a dream. Checking the depth at various places. Another advantage of the router plane is that it makes it very difficult to have an uneven depth. 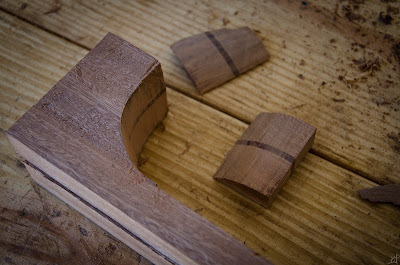 Returning now to the heel block, waiting for the truss rod to come in, the back end is prepared for squaring. This will maybe change later as I figure out the angle of the neck in relation to the body, but I would rather have this prepared for that now. 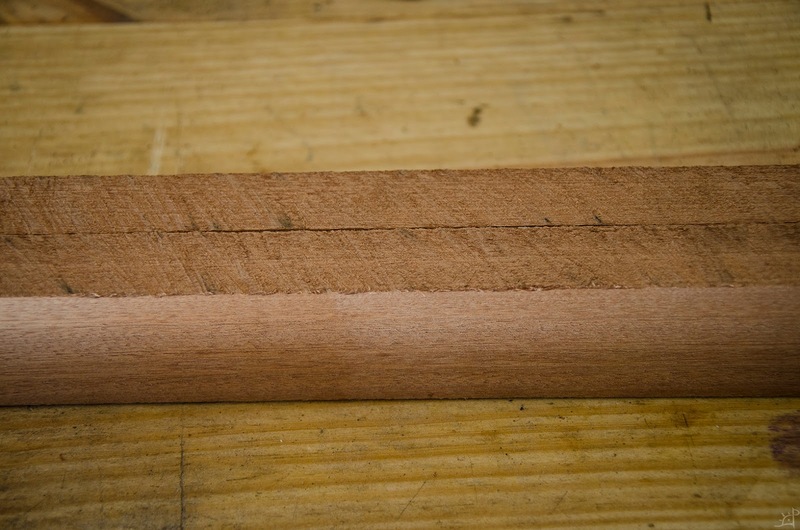 And the curve of the block. 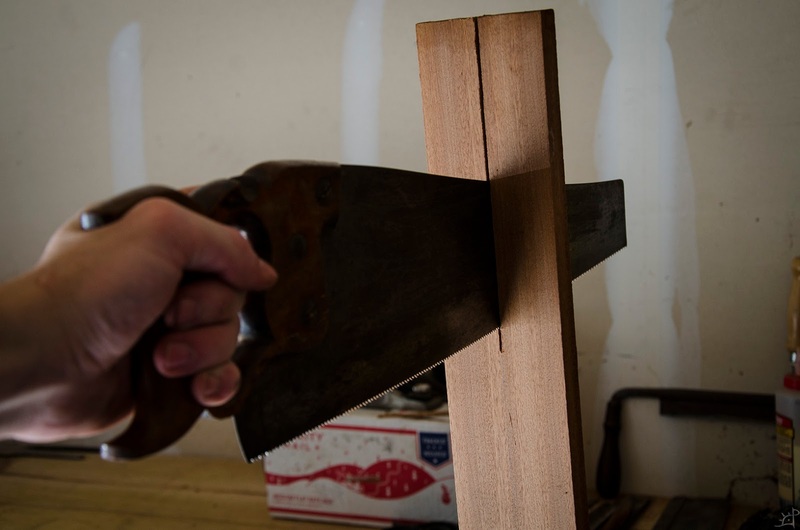 I thought the coping saw would be a bit less accurate after cutting the overly wide neck block for the body, and this cut has far less room for error. The small end is already pushing the limits for how short it is, and having a cut out of square could have been catastrophic. Luckily it all worked out (for now). At this point it is starting to look like I hoped it might. 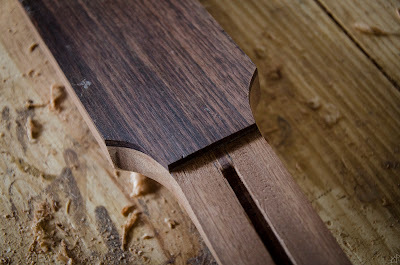 The cut, although still rough, has virtually no sign of the seams on either face and the shape seems to be appropriate. Early in the shaping of the underside, I thought about using the spoke shave or draw knife. but each time I picked it up I had a horrible vision of it utterly destroying the wood after catching errant grain. 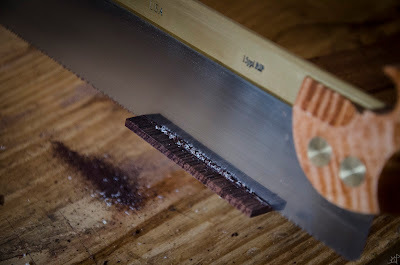 So, I took the slightly longer, and I realized after the fact that it was truly very slight, and used rasps and files. 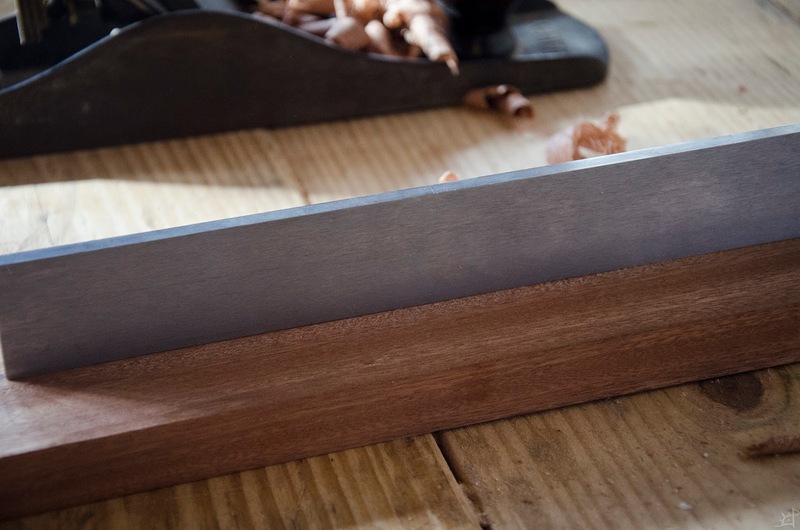 A pattern maker's rasp would have been nice to have, but the regular old hardware store rasp and an old file did the trick. 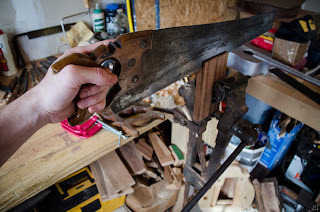 On the larger flats, I also used an old farrier's rasp, retired from being used on hot steel, which is extremely aggressive on wood. 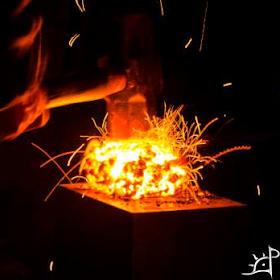 With that take care of, it was back to the head. 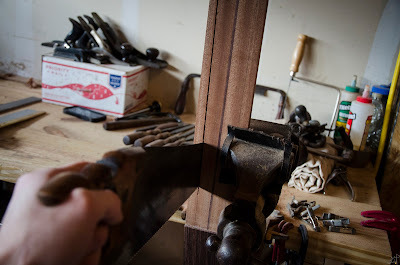 I intended to shape the head entirely in this post, but it is already excessively long and there are some uncertainties with how the tuning pegs need to be aligned. So instead, I made the first cut to ease the transition. 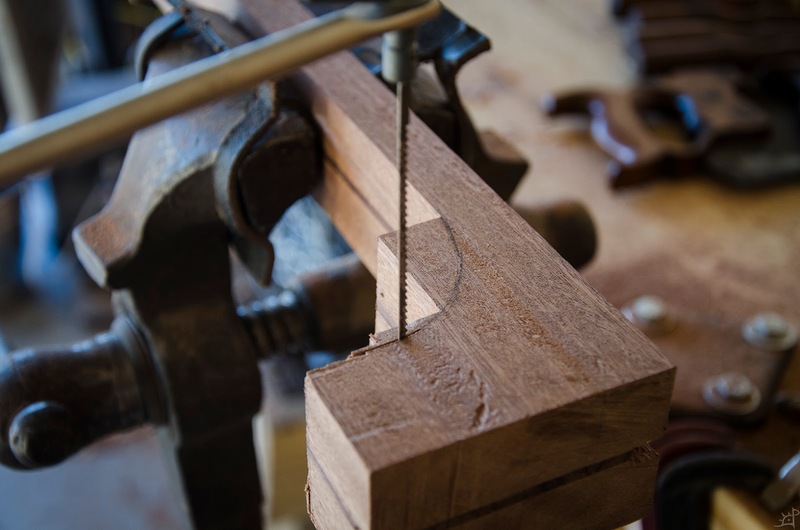 The removal of the corners also allows the router plane to travel forward by another half inch or so, which helped clean the end of the truss rod channel previously worked entirely by chisels. A quick trip with the coping saw and it's ready for rasps. Here again I was concerned I might find that the joint between the faceplate and neck would reveal gaps, but there were none to be had. 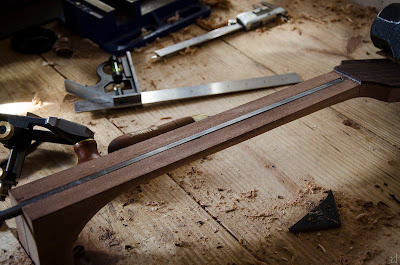 Finally, the truss rod arrived and I could fit the end of the channel to seat it properly. 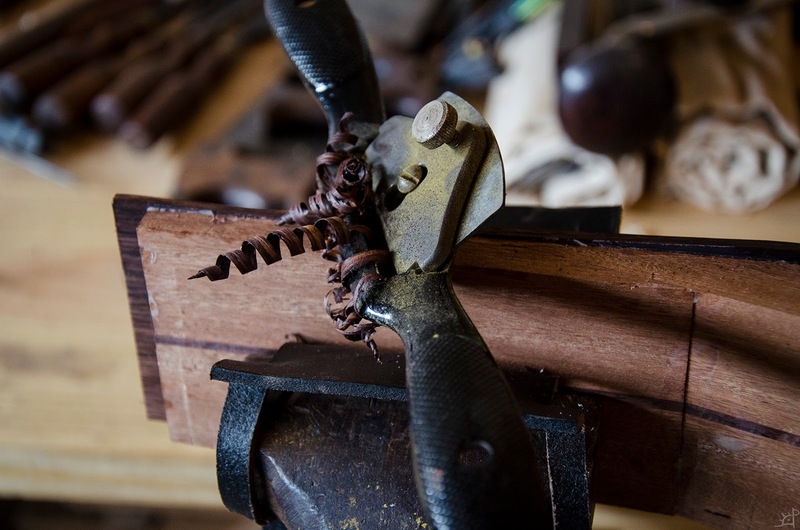 I used a scrap bit of leather against the faceplate to prevent damaging it, and chiselled down to expand the groove just slightly where the router plane cannot reach. And that's it! The truss rod is ready for action and all is well. 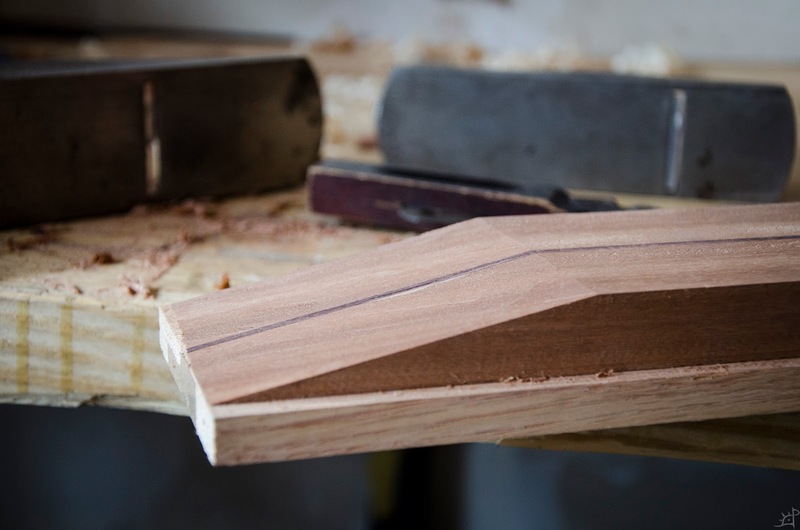 There is still a fair amount of work to do with the neck, namely dealing with the fretboard which goes over the truss rod, and all manner of joinery to the body.